Streaming on Twitch! Come watch, chat and give critiques! So I have been streaming on twitch on the creative creative channel. My channel is http://www.twitch.tv/corydanimates. I have do not have a set scheduled set right now since my day to day is in flux. Follow and if I am on it will show up in that feed! Currently I am working on the 11 Sec Challenge for December. Right now worked on stream towards a Environment Drawing for the scene (Below). Next up on stream blocking out the scene with simple box modeling for layout. Just trying to keep the flow going heading to animation over just scene modeling and texturing. Since I would also love to model, light and texture the scene for the whole month. Well hear we go! Drawing of the scene for the 11 sec club challenge. Well I moved from Maryland to Georgia over the summer. Getting back into the swing of things. Had some major car trouble along the way, but nothing I can workaround. I have a personal studio set up now! So no longer working in my bedroom! First order of business is to get back to creative streaming on twitch. That page just exploded with Adobe and Bob Ross streams to give major light to this group page. So Ill be running once again my 11 second club stream for the month of November. Since square space benefit with minimalist site design. I created a more art dump style site using artstation.com. Then if I need to I can just refrence from that site to make this main side more modifiable to my needs. I am also getting my sculpture out from storage since I had to move them from a cube at work. 3/26/15 - Twitch Stream. Working on a Rigging toolkit in Maya! So I started to work on a rigging toolkit in Maya with Python. Mostly due having a commercial version of that package and knowledge of its common library structure a lot more so I can build it up quick. Also short spinet movie of the night and code from that night. >>>>> print "CDD_BONEUP_ROOT Environment Var is not correct"
>>>>> import sys print cdd_BoneUpRoot path = cdd_BoneUpRoot + "/Modules"
Square space Mark down function make showing the code odd. But I hope it gets the point across. 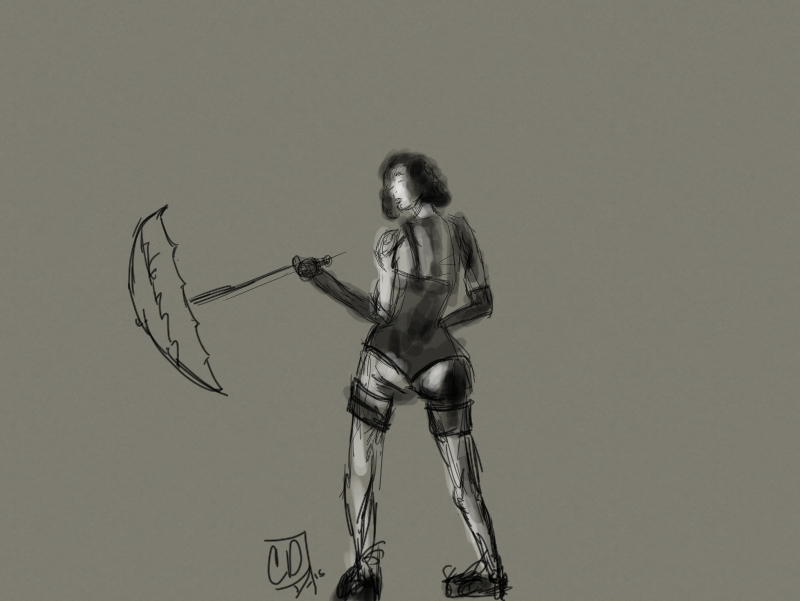 Conducted a quick stream of me working on improving in gestural figure drawings with 30 sec and 60 sec intervals. I have not drawn on stream in over a week so I was rusty. Bellow is the off stream study. Attempting to get the the export of the stream onto you tube to post. So found out my personal version of 3Ds Max is account locked to my old workstation. Ill need to get in contact with Autodesk to see if I can activate it on my newer PC. Saturday was a QA workday. I managed to study up on Lue scripting, it does not seem hard. I can see the C and Java script hooks it was influenced by. Downloaded a trial version of 3Ds Max 15 and I will be working in that till that trial time runs out. Something Quick I did to make sure I still knew what to do in Max in terms or bone creation. On to white boarding a simple script in Python for Max. Yearly update. Lots of Game releases, keeping me busy. Well that was a year that I kinda lost track of things, like this site. So after the game jam 2014 I was in the middle of a crunch for “Wolfenstein: The New Order” and the crunch has not really stop since its release and being moved onto to an already finalizing “The Evil Within”. On top of this I was planning my brothers bachelor party event that simply was a skydiving tandem event. So we got to jump out of plane to celebrate! It was so fun I decided to do the HALO tandem jump the dropzone provided a month later. I would love to pursue a AFF class to earn a parachuting licence, but its definitely an investment of a hobby. So that is on hold for now. I competed in this years Global Game Jam and I chose the Magfest location. The team I was on (after the first two teams I joined dissolved) used Unity and I was one of their 3D artist. I modeled in Maya, UV mapped in 3D coat (just based on being able to UV map quickly) and texture painted in Mari (again for speed). The whole festivities of Magfest being a major distraction made this event rather lackluster in my heart so Ill just say I did what I needed to do and took it as a learning lesson. Currently I am still on “The Evil Within” and its DLC cycle of publication so this has been keeping me fairly busy. I am also streaming my creative works on twitch’s newly form creative channel. My Twitter is hooked up to announce when I stream, since that the best use I can think of for my twitter account. Those are the big points of my life I like to share since GGJ 14. Lets see if I can make more use of this blog to post my twitch WIP reports or something along those lines. I took part in the Global game jam a few weeks ago and this was my teams entry. It was created in Unity 3D. My roll were a little bit of everything besides programming , but I was was the industry vet of the team and took up as the "Producer" type. I was surprised at the talent that are in Richmond, VA. Most of the Jammers were VCU alumni or students, and guess what they know what they are doing. My team consisted a Community collage instructor, a museum artist, and Indie dev who is close to finishing his own game AnotherCastleTheGame.com . We sadly had two others but they dropped out after the second day. Game Jams is a different beast and I was glad I was ready for it. Our Global Game Jam Game 2014. The game concept came from the topic for that game jam “We don't see things as they are, we see them as we are”. The team came up with an idea to jump between different perspectives to accomplish a goal. That goal to escape a zoo, with that in mind our team prototyped a quick perspective shift ability in Unity that originally was to be used with the Oculus Rift (this was cut since we wanted other functionality and were running out of time). The First day we accomplished the perspective swap tech and started to nail down animals we were going to use and motor controls so the size of the animals would be varied based on size. The Second day we figured out the game systems we wanted to use and found that the game was about escaping a zoo by using the strengths of certain animals. this included the flow chart of what animal would be used to full fill the objective. Last day was putting all the art and gameplay together. This Game jam was my first and it was not crazy and was rather easy. Unity and the team that was created worked so well. The payoff was the presentation night, we had a great cheer for our endgame solution that was a bug that the elephant would shoot up in the air. We got a great crowd ovation for that. Such a wonderful night. The pay off our GameJam game was a Success!